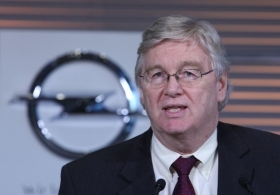 Opel CEO Nick Reilly hopes GM's increased investment in Europe will win government aid. General Motors Co. said it will contribute 1.9 billion euros ($2.57 billion) toward the restructuring of Opel/Vauxhall, more than tripling its previous investment pledge of 600 million euros. The GM contribution would be made in the form of both equity and loans, Opel CEO Nick Reilly said on Tuesday. GM's increased investment means Opel will have enough cash to operate through the year. It had previously said it had enough liquidity to operate well into the second quarter. It could also help GM to win state aid for Opel's restructuring from European governments, particularly Germany, where Opel is based. The Berlin government has been demanding that GM inject more money into its European operations. Opel said on Tuesday that GM has cut its request for state aid and is now asking the governments for less than 2 billion euros. It has also increased the total restructuring budget at the request of the governments. "An additional 415 million euros had been requested by the respective European governments to offset the potential impact of adverse market developments," Opel said. That raises the cost of restructuring Opel to about 3.7 billion euros, which Opel said would remove any potential liquidity risks this year. At the same time, GM is now asking governments to contribute less than 2 billion euros in aid versus the 2.7 billion euros it previously wanted. "We hope that our strong commitment will be well received as a major milestone in our ongoing discussions about government guarantees to cover the remaining gap," Reilly said in a statement. GM's plan for Opel envisages 8,300 job cuts factories across Europe, shuttering the Antwerp, Belgium, plant as well as 20 percent capacity cuts and a return to profit by 2012. Germany -- where half of Opel's staff work and which was supposed to provide the majority of aid -- had been cool to the idea of giving taxpayer funds into Opel. GM last year scrapped plans to sell Opel and asked European governments and workers to contribute to the cost of returning the carmaker to profitability. GM had originally asked European countries with Opel plants -- including Germany, Belgium, Britain, Austria, Poland and Spain -- to contribute 2.7 billion euros of aid. "It is of vital importance for GM to demonstrate our commitment for our European operations," GM Chairman and CEO Ed Whitacre said in a statement. Labor representatives have criticized GM's plans to shut Antwerp and rescinded their promise to contribute 265 million euros in annual cost concessions.